Just yesterday I went to an event organised by the beautiful Azima Musayeva, the designer behind Azima Exclusive. The event was at an occasion of a launch of her collection at a Lab Nine shop in Walton street in London. Now if you don’t know the brand, you are not alone, as until recently I didn’t know about it either. However I am sure we will hear more and more in the near future. Azima Exclusive makes the most gorgeous cuffs, necklaces and brooches you can imagine. They are all hand made, very unique in style but also in quantity of each design. Azima Exclusive uses the most precious french lace and all the pieces are made in Italy with a skill of an haute couture. Each piece takes almost a day to make but to create the idea with all its beautiful designs can take several days. When I saw the collection few weeks ago for the first time, I was immediately in love and spent long time just trying different styles on. It was very difficult to decide which piece to buy. When I finally decided that I want cuffs instead of a collar, I had difficulty to decide whether I want something more formal or for everyday life. In the end I chose very delicate and simple black lace. The velvet black ribbon is a beautiful touch, like cherry on a cake. I was already wearing those few times for dinners and got a huge amount of compliments on them. 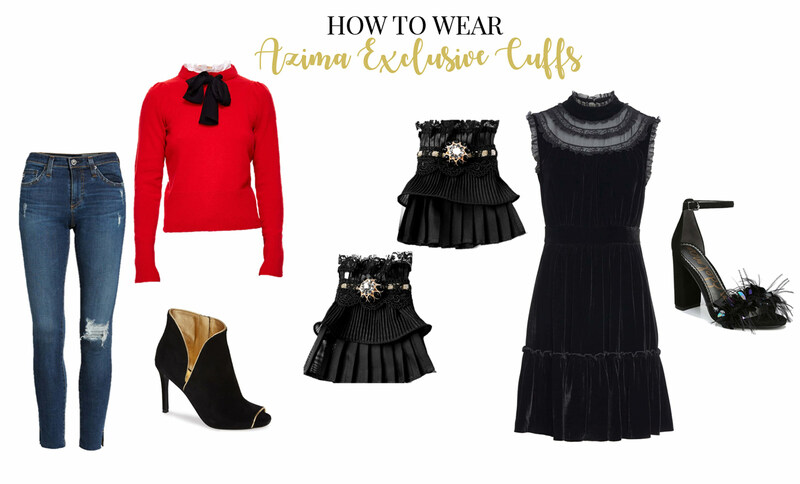 What I love most about Azima Exclusive cuffs is that they add that extra something to your whole outfit. Few weeks ago, I didn’t know the brand and I wasn’t missing it. Now I found something I never new I wanted. On the pictures I was wearing my cuffs with new navy blue lace dress by Atlantic Pacific with black velvet bows and black velvet Zara belt. This dress has a lot of details already however I loved to add the cuffs with it. I also wore them once with a black simple cashmere sweater. It looked like I had a shirt with beautiful sleeves underneath. That is the thing about this accessory. You can match it to quite a lot of things and it will always transform your outfit. They are perfect for the evening, but will look great also in the office during the day. The most difficult part is to choose. The prices are between £100 and £300 for the cuffs, £130 and £400 for the collars and you can also buy matching sets. I know it is not cheap, but that is what you pay for gorgeous quality and now with Christmas approaching, maybe it can be something you want to put on your Christmas wish list? It is a piece of luxury you will always be happy to have in your wardrobe and you can discover the whole collection here. So what do you think? Isn’t this the most beautiful and unique piece of accessory you have ever seen? What an incredible article ! You look fabulous with Azima Exclusive cuffs , the perfect touch for the perfect lady ! Thank you so much Caterina, that is very kind of you!